The 2010-11 episode also highlights the difficulty of performing what amounts to “environmental triage” on degraded river systems such as the Murray-Darling, while still ensuring that everything stays in balance. 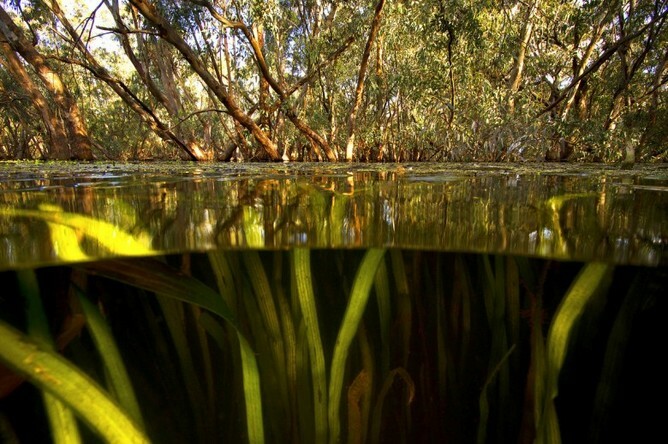 Environmental water supports key habitats for wildlife, like this flooded forest in the Macquarie Marshes, NSW. A key aim of environmental water programs is to improve native fish populations, while suppressing alien species. Getting it right involves more than just replacing the water lost to irrigation – it also requires a sound knowledge of the ecosystem and an appreciation of when and where to inject extra water to avoid unintended consequences. Common carp are one of the dominant fish in the Murray-Darling Basin and have the potential to invade all of Australia’s freshwater systems. It’s not just a problem for Australia – carp, which are native to eastern Europe, have been spread to over 90 countries and are now present on every continent except Antarctica. Lowland wetlands are particular hotspots of carp reproduction. Adult carp live in the main river during dry periods, but move onto floodplains to spawn during floods. Individual females can produce more than 1.5 million eggs (20% of their own body weight) that hatch after 5-7 days. Juvenile carp stay in floodplain habitats until they reach 75-100 mm in length. Unfortunately, these areas are also targets for restoration using environmental flows. 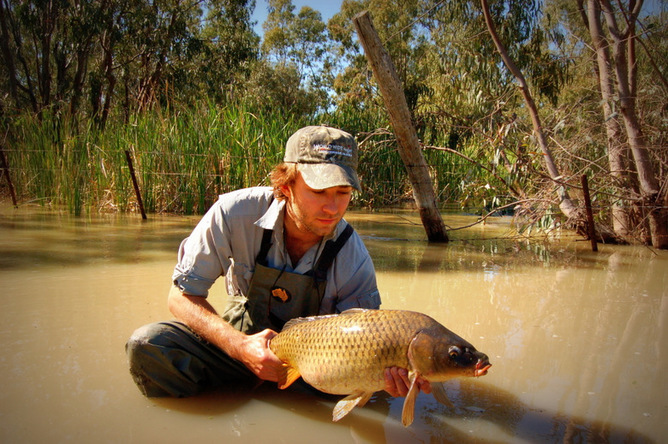 Tom Rayner with a large adult carp caught on the floodplain of the Macquarie Marshes, NSW. During the floods of 2010-11, we surveyed fish populations in the Macquarie Marshes, an internationally significant wetland at the heart of the Murray-Darling Basin. We wanted to see how native and alien fish species responded to widespread flooding, and to better understand why carp are doing so well when native fish populations seem to be suffering. The results were startling. Flood waters hit the Marshes in late winter, when water temperatures were still low. Carp immediately moved onto the floodplain, while larger-bodied native fish, such as Murray cod and golden perch, moved upstream to their own spawning grounds. Environmental water was then used to maintain flooding until Burrendong Dam – the major upstream water store – overflowed. The intention was to maximise overall ecological benefits, balancing the needs of all the various flood-dependent species in the ecosystem. The problem was that the floods began in late winter, well before temperatures had reached the thresholds for native fish to start spawning. By the time flooding peaked in December, it was too late. Huge numbers of carp, which had hatched earlier in relatively cool water, had already grown to 100-150 mm and, we suspect, were in ideal condition to outcompete (and possibly eat) any larval and juvenile native fish. We found that the longer spawning window available to carp meant they were much more abundant than any of the native species. What’s more, the average spawning temperature of the species that have colonised the Macquarie Marshes since European settlement (including carp, mosquitofish and goldfish) was significantly lower (16C) than that of the five native species that have not been caught in the Marshes since 2007 (22.6C). These differences may be important, considering that the way in which water is released from dams can have a big impact on the river’s water temperatures. Releases of cold water from the bottom of Burrendong Dam reduce river temperatures by 8-12C and can delay natural high water temperatures by up to three months. This cooling may go some way to explaining the increasing dominance of alien species in the Macquarie Marshes since flow regulation began in the 1960s. If we are to successfully conserve and restore fish populations across the Murray-Darling Basin, we need to continue monitoring both natural and managed flow events, and learning more about how different fish respond. This includes not only the magnitude of flooding, but also its duration, extent and timing. In future, environmental flows can be held until it’s warm enough for native fish to begin spawning when environmental flows do reach these wetlands. Fortunately, the progress that has been made in recent years towards flexible, adaptive management of the Basin makes this a real possibility. We can also look at adjusting dam offtakes, so that water is taken from the warmer top layers of the dam rather than the cold water at the bottom. Lastly, we can reduce carp numbers by separating them from native fish and removing them from the river. In any case, the hard lessons we are learning in the Murray-Darling serve as an important reminder to carry on looking after our other, relatively healthy river catchments, to spare them (and us) from these difficult challenges. Tom Rayner is Research Leader at Charles Darwin University. Richard Kingsford is Professor, School of Biological, Earth and Environmental Sciences at UNSW Australia. Older PostA yabby is a crayfish but a cray is not a yabby: what’s in a name?